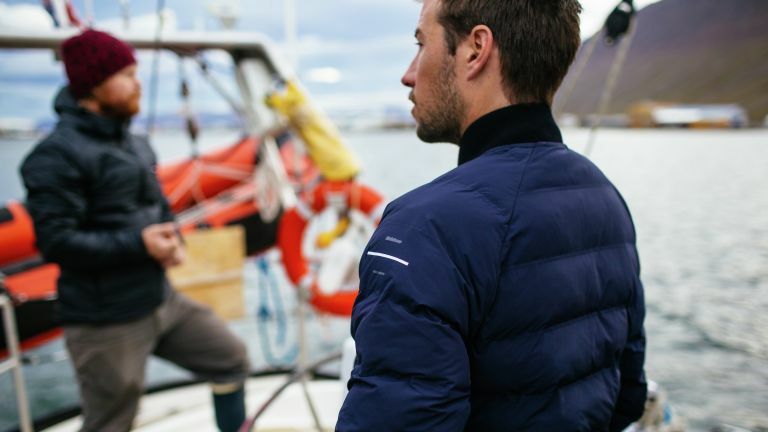 Finisterre has just released 'True North', a premium capsule collection which embodies the pinnacle of Finisterre's design and a series of pioneering projects at the forefront of fabric technology. The collection uses Finisterre's Engineered Insulation, British Bowmont Merino, HD Wool, and Denim. Our highlight of the collection is the Bowmont Shirt, which uses 100-percent British Bowmont Merino wool. Bowmont combines the hardiness of a Shetland sheep with the softness of a Merino. The sheep are reared in Devon, the wool is processed and spun in Yorkshire, then finished in Birmingham – making the supply chain 100-percent British. Another favourite is the Tomma Bomber jacket, created using an innovative three-dimensional weaving process. This results in baffles which are built into the fabric rather than stitched in, getting rid of the tiny holes which let air escape. The bomber is filled with Finisterre Engineered Insulation C-form, which mimics the look, feel and performance of down, with the added benefit that it's 100-percent recycled. The True North collection also features HD Wool – a wool insulation with is sustainably sourced, biodegradable, renewable and totally recyclable. Finisterre are pioneering the use of this material as a technical fibre. And finally, the Ovis slim jeans are made from specially engineered 12oz denim containing the perfect blend of wool, polyester and elastane that makes them warm, comfortable and durable, with just enough stretch. We think it's a great looking, but crucially high-performance collection, combining innovative new construction techniques with traditional fabrics. Prices start at £110 (around $145USD) and are available from Finisterre's website.